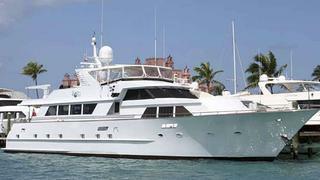 Now for another November sale as Lon McCloskey at The Marine Group tells me he's sold the 30.48m motor yacht Lily Pad with Chuck Royhl of Sarasota Yacht & Ship bringing the buyer. Lily Pad was built in aluminium by Broward in 1987 and had a thorough refit in 1996 giving her a new interior in oak and anigre woods. She has the yard's signature 'country kitchen' galley and an open plan saloon has a comfortable living area in front of an entertainment system including a Sony 42 inch television. The master suite has a king size bed, vanity unit and vast wardrobes and there is a double stateroom with a queen size bed. The twin cabin comes with a Pullman berth. All staterooms have new television screens, sound systems and full en suite facilities. On the technical side, twin 870hp Detroit Diesel engines give her a cruising speed of 13 knots and maximum speed of 16 knots. Lily Pad was asking $990,000.